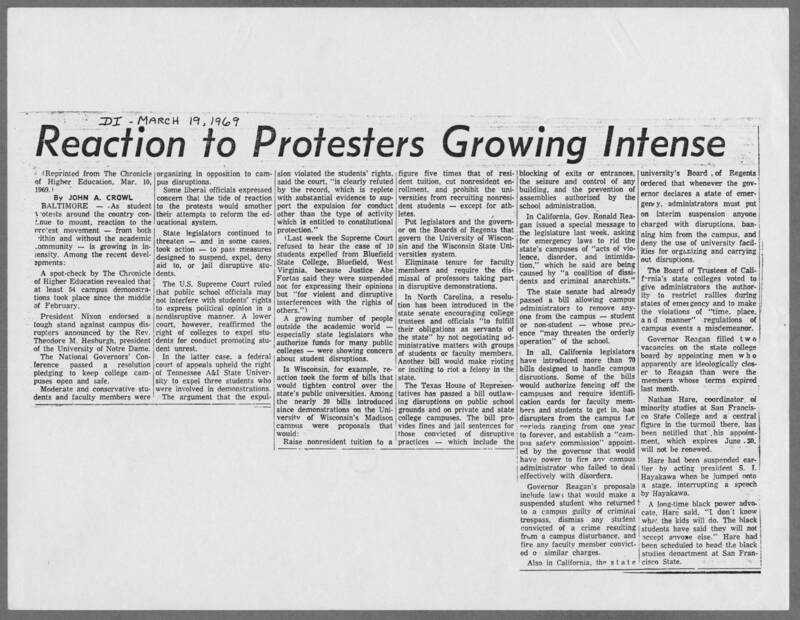 DIY History | Transcribe | Social Justice | Student protests, 1969 | 1969-03-19 Daily Iowan Article: ""Reaction to Protesters Growing Intense""
1969-03-19 Daily Iowan Article: ""Reaction to Protesters Growing Intense""
[handwritten] DI - MARCH 19, 1969 Reaction to Protesters Growing Intense (Reprinted from the Chronicle of Higher Education, Mar. 10, 1969.) By John A. Crowl BALTIMORE — As student protests around the country continue to mount, reaction to the protest movement — from both within and without the academic communithy — is growing in intensity. Among the recent developments: A spot-check by The Chronicle of Higher Education revealed that at least 54 campus demonstrations took place since the middle of February. President Nixon endorsed a tough stand against campus disrupters announced by the Rev. Theodore M. Hesburgh, president of the University of Notre Dame. The National Governors' Conference passed a resolution pledging to keep college campuses open and safe. Moderate and conservative students and faculty members were organizing in opposition to campus disruptions. Some liberal officials expressed concern that the tide of reaction to the protests would smother their attempts to reform the educational system. State legislators continued to threaten — and in some cases, took action — to pass measures designed to suspend, expel, deny aid to, or jail disruptive students. The U.S. Supreme Court ruled that publilc school officials may not interfere with students' rights to express political opinion in a nondisruptive manner. A lower court, however, reaffirmed the right of colleges to expel students for conduct promoting student unrest. In the latter case, a federal court of appeals upheld the right of Tennessee A&I State University to expel three students who were involved in demonstrations. The argument that the expulsion violated the students' rights, said the court, "is clearly refuted by the record, which is replete with substantial evidence to support the expulsion for conduct other than the type of activity which is entitled to constitutional protection." (Last week the Supreme Court refused to hear the case of 10 students expelled from Bluefield State College, Bluefield, West Virginia, because Justice Abe Fortas said they were suspended not for expressing their opinions but "for violent and disruptive interferences with the rights of others.") A growing number of people outside the academic world —especially state legislators who authorize funds for many public colleges — were showing concern about student disruptions. In Wisconsin, for example, reaction took the form of bills that would tighten control over the state's public universities. Among the nearly 20 bills introduced since demonstrations on the University of Wisconsin's Madison campus were proposals that would: Raise nonresident tuition to a figure five times that of resident tuition, cut nonresident enrollment, and prohibit the universities from recruiting nonresident students—except for athletes. Put legisltors and the governor on the Boards of Regents that govern the University of Wisconsin and the Wisconsin State Universities system. Eliminate tenure for faculty members and require the dismissal of professors taking part in disruptive demonstrations. In North Carolina, a resolution has been introduced in the state senate encouraging college trustees and officials "to fulfill their obligations as servants of the state" by not negotiating administrative matters with groups of students or faculty members. Another bill would make rioting or inciting to riot a felony in the state. The Texas House of Representatives has passed a bill outlawing disruptions on public school grounds and on private and state college campuses. The bill provides fines and jail sentences for those convicted of disruptive practices — which include the blocking of exits or entrances, the seizure and control of any buiding, and the prevention of assemblies authorized by the school administration. In California, Gov. Ronald Reagan issued a special message to the legislature last week, asking for emergency laws to rid the state's campuses of "acts of violence, disorder, and intimidation," which he said are being caused by "a coalition of dissidents and criminal anarchists." The state senate had already passed a bill allowing campus administrators to remove anyone from the campus—student or non-student—whose presence "may threaten the orderly operation" of the school. In all, California legislators have introduced more than 70 bills designed to handle campus disruptions. Some of the bills would authorize fencing off the campuses and require identification cards for faculty members and students to get in, ban disrupters from the campus for periods ranging from one year to forever, and establish a "campus safety commission" appointed by the governor that would have power to fire any campus administrator who failed to deal effectively with disorders. Governor Reagan's proposals include laws that would make a suspended student who returned to a campus guilty of criminal trespass, dismiss any student convicted of a crime resulting from a campus disturbance, and fire any faculty member convicted on similar charges. Also in California, the state university's Board of Regents ordered that whenever the governor declares a state of emergency, administrators must put on interim suspension anyone charged with disruptions, banning him from the campus, and deny the use of university facilities for organizing and carrying out disruptions. The Board of Trustees of California's state colleges voted to give administrators the authority to restrict rallies during states of emergency and to make the violations of "time, place, and manner" regulations of campus events a misdemeanor. Governor Reagan filled two vacancies on the state college board by appointing men who apparently are ideologically closer to Reagan than were the members whose terms expired last month. Nathan Hare, coordinator of minority studies at San Francisco State College and a central figure in the turmoil there, has been notified that his appointment, which expires June 30, will not be renewed. Hare had been suspended earlier by acting president S. I. Hayakawa when he jumped onto a stage, interrupting a speech by Hayakawa. A long-time black power advocate, Hare said, "I don't know what the kids will do. The black students have said they will not accept anyone else." Hare had been scheduled to head the black studies department at San Francisco State.